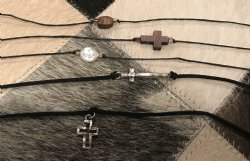 Assorted choker necklace styles! Select the style based on the picture shown. Each choker has an adjustable clasp. You decide the length. Each choker can be adjusted from 12" to 14" in length.